Imagine, What happens when your loved one gets a cut on her hand, what are you reactions? What happens if in place of a cut on finger it’s the finger or worse still the hand that gets chopped? It would hurt you, wouldn’t it? Now imagine if you knew you could do something to save this, if you knew that it is your carelessness and indifference that has lead to this? Wouldn’t you feel guilty? You surely will and post facto you feel that you would go to any extent to save your loved ones. But the hard reality is its post facto. A major event like aa 11th sept. or 11th July changes the lives of the people who are affected but for everyone else it is just a gruesome news. Would it require hundreds of blasts killing atleast someone loved for everyone to get us together? I think that is the core of the message that “Mumbai Meri Jaan” wants to pose. It’s a movie that makes an appeal. As the title credits passes on with the videos of our political history being played on the screen, I thought that the movie is going to be a docudrama on what happened during the serial Mumbai blasts in the train and how people tackled it and I almost believed that by intermission. But a movie that starts off with its cast, acting the crowd that we see every day in trains, in buses, on roads, in malls, in colleges, in offices, takes a sharp turn midway and goes on making many comments on the social consequences of an insensitive individualism that we are breeding. Mumbai Meri Jaan is about us. It is about things that drive us. Fear, Hatred, Necessities, fame, power, ambition, love and frustration at times. 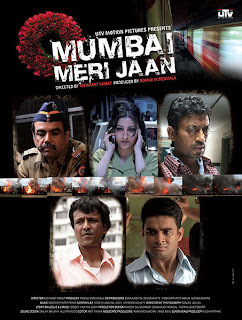 It focuses in the first 5 with its 5 characters Nikhil Agarwal (Madhvan), Suresh (Kay Kay), Tukaram Patil (Paresh Rawal), Rupali (Soha Ali Khan) and Thomas (Irrfan). There is a beautiful small role played by Vijay Maurya (as constable Kadam), who builds in a frustration of not doing what he must do. That small role shows the other aspect of these drives, frustration for not being able to do what one is supposed to do. The story is about how one event and its aftermath changes lives of these 5 characters. Nikhil’s wife is expecting a child, he travels by train, he wants to do keep Mumbai safe and clean in his own small way. He is a believer that small efforts from everyone will count. He represents an Ideology that a small part of our young, literate, upwardly mobile young people likes. His life changes as he sees that anything could happen to anyone. He is scared for his family and for the society. He has an option of moving out of the country and but he chooses not to run away from the problems that his society is facing. The blast induces in him the fear of the thing happening again during his travels. Rupali represent that part of the society which is the source of information for everyone around. She represents the press that sensationalizes every issue and gets a story out of pain for their viewership. The blast gets her fiancé killed and the tables turn as she becomes the story herself. Thomas, is the ignored, unimportant, underprivileged and suppressed part of our society. He is nothing to any body, and so is his family. The world he lives in has nothing for him apart from suffering, all pleasures are for the rich. The blast gives him a chance to become important. His stray phone call makes him feel important as he could see people panicking and police moving around with his one phone call. Tukaram and Kadam are the mute spectators. Tukaram representing the major part of us who have adjusted to whatever is happening and though he knows what is right and what is not, he has no intentions even trying to correct the wrong, as he knows there are powers bigger than him which would not let him do that. Kadam on the other hand feels he is avoiding his duty by not doing what is right. Some of the most beautiful dialogues in the movie come through their interactions. Blasts changes their lives as they realize that they need to do their duty, however difficult it may be, they need to try getting out of the usual and do things differently. They represent the unequipped saviors that we have in our policemen. The movie in place of showing a dark saddening consequence, which real life has, turns to a very optimist ending. Nikhil overcomes his fear, Suresh his hatred, Rupali her hypocrisy, Thomas his need for attention and power and Tukaram, his corrupt life. The movie has a lot to say as the lives of its characters move on. The movie ends with a note of hope for everyone. I would absolutely and loudly like to appreciate the director Nishikant Kamath for not sticking to the real life situations that we face in the second half of the movie and giving a critical statement on society through his work. The second half of the movie moves the normal people he shows in the first part to their edge. It was a kind of storytelling post interval that I enjoy the most. I would have loved it even more if the director would have featured the why part of the movie well. There was no mention on the motives of the people who do this. They too are as much a part of us as the other characters are. One where Irrfan as he gets down from his cycle, buys a 2 rs. Parle-G biscuit to have as food with a cup of tea looks over a rich brat, smoking a 100rs. Cigarette and throwing his mobile worth a few thousands on road in anger, crushing it. Beautiful. Other scenes were the ones like Madhvan watching the potholes thinking of the taxes he pays and the government, a small sequence where the reporters making story out of Rupali, walks over the reflection of hers on the tiles of her house, also the one where Irrfan Khan spreads his arm and feels powerful after the phone calls, One where Kadam tries to kill himself and the one where Madhvan watches India and then America in the google earth depicting the difference. All these without a single dialogue will leave you with a lot of food for thought and few tears in your eyes. Surprisingly the person who wrote these beautiful scenes also wrote the beautiful dialogues in the movie, with most of the Kadam – Tukaram dialogues written with great panache. “Dil ke theatre mein picture ko chalne dene ka, par act nahi karna” , “ hum kab se yahi kar rahe hai… kisi ko to kuch alag karna padega, agar tu mujhe dhakka mare aur mein tujhe nahi maru to ?” “Sir insaan ko hevaan banne mein sirf 2 minute lagti hai” “ Ye Log Piyenge nahi to Mumbai mein Spirit Kaha se ayega” … and so on. Cinematography by Sanjay Jadhav captures the life of mumbaikars in the office, in the trains, in the chawl and in the small shoddy hotels very well. Editing by Amit Pawar fits the narration best. A special mention I think should be given to the visual effects by Rajiv Raghunathan as the blast scenes are absolutely moving. They jolt you in your seat and make you feel the pain of the victims. Irrfan Khan and KayKay I thought were the real winners amongst the actors. Beautiful expressions, bringing life to even those scenes that hardly had any dialogues. Paresh Rawal shines as was expected from him and so does Vijay Maurya. Soha Ali Khan apart from a few jittery dialogues does very well in a few of the scenes. Madhavan I thought was a perfect casting in the role he played. One department that I thought could have been better was music and the back ground score (Sameer Phaterpekar). Barring this and the fact the movie left a stone or two untouched, not getting in to a territory that could lead in to a cluttered story line or the fact the movie gets into the preaching mode at times, the movie has a little to get criticized about. Ofcourse, the technical parts of the movie making have been far better in many other movies, but storytelling, which is the most important of it, has been beautiful in the movie. With a bias for the fact that the second part of the story telling was more towards my liking I would like to go with a 4* for this movie.